We are pleased to bring you a short interview with former Sr. Money Editor at US News & World, Kimberly Palmer. She’s the author of several personal finance books, including newly released (6/1), Smart Mom Rich Mom – How to Build Wealth While Raising a Family. She’s also giving away her new book to one lucky reader. All you have to do is comment to enter. 1 What prompted you to write about how mother’s can build wealth for their family? 2 Mother’s are often expected to do so much today. Isn’t “making or saving money” just one more thing that needs to be added to the to-do’s? 3 Why do you think more mothers are needing to stretch their dollars and make money? 4 What trends are you seeing among mothers who are looking to help out the family budget? What seems to be working? 5 Your book contains checklists, action steps, planning tools, and more to help mothers. Can you share one simple thing most moms could do today to help their families out financially? 6 What do you hope mothers take away from the book? What prompted you to write about how mother’s can build wealth for their family? As someone who has written about money for the last 10 years, I started noticing, especially after I became a mom about six years ago, that so much of the financial advice aimed at moms was really limited to couponing and retail discounts. But moms are in charge of such bigger issues for their families — issues that can save hundreds or even thousands of dollars a year. For example, opening up and saving into a college savings account for kids, saving for their own retirement, signing up for flex spending accounts through work…we’re managing a lot of big issues, and I wanted to write a book to help us make decisions that build wealth over time. Mother’s are often expected to do so much today. Isn’t “making or saving money” just one more thing that needs to be added to the to-do’s? Yes! Moms have an endless amount on our plates and it’s hard to add one more — but prioritizing money management can do a lot to reduce our stress overall, because we can feel secure knowing that we have money in the bank that’s growing. It’s worth putting in an hour or two each month to managing the family finances. Why do you think more mothers are needing to stretch their dollars and make money? Raising kids is so expensive, and we also experiencing economically uncertain times, having recently lived through the Great Recession and its aftermath. We need so much money — on average around a quarter of a million dollars — to raise each child, and that doesn’t even include the cost of college. What trends are you seeing among mothers who are looking to help out the family budget? What seems to be working? What works best is when moms embrace their role and make it a priority to really get organized, review their accounts at least once a quarter, rebalance long-term investments like retirement accounts — just making it a priority and deciding to invest that time makes all the difference. Personally, I like organizing everything in a binder so I can print out one statement for each account, which I update once a year, and make sure nothing slips through the cracks. For example, because of this system, I noticed one year that we forgot to pay our homeowners insurance policy, and I was able to quickly fix that before anything bad happened! Your book contains checklists, action steps, planning tools, and more to help mothers. Can you share one simple thing most moms could do today to help their families out financially? One simple thing is talking to your kids — and making sure your talking to both daughters and sons, because studies suggest we tend to talk more to sons — about money. Not only does it help impart lessons that will stick with them through life, but it also makes us more mindful of what we are modeling to them — and might even inspire better habits. Now that my daughter is so aware of the need to save money, she’s the one that suggests frugal choices, like making dinner instead of ordering pizza. What do you hope mothers take away from the book? I hope it inspires moms to make some changes that really benefit their family financially long-term. The moms I interviewed for the book taught me a lot and I changed some of my own behavior as a result, including creating new college savings account and talking to my daughter more about money. Small changes can make a big different in the long run. 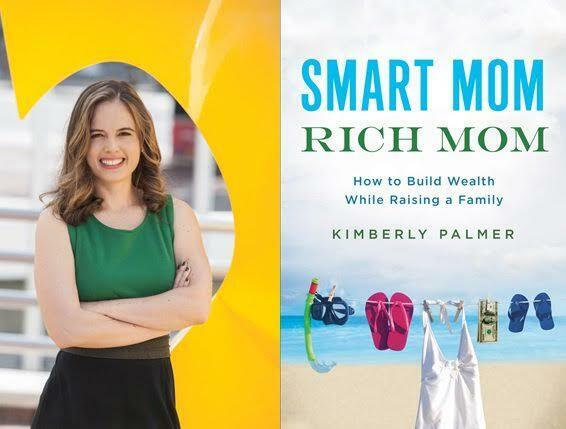 Win a copy of Kimberly’s new book, Smart Mom Rich Mom (link if you’d like to purchase) by submitting a comment below. We’ll draw one random reader on 6/12. Good luck and thanks for reading! Update 6/13 – CONGRATS TO SANDY FOR WINNING THE BOOK! What to do Based on Events at LendingClub? I love the idea of creating a binder to be updated. I keep file folders, but to have all the information in one binder makes so much more sense! It’s so true that a lot of the financial advice out there for this demographic is to shop sales and use coupons. I think it takes creativity to determine proactive ways to manage your family’s finances well in a manner that is well-suited to the family’s needs. I would enjoy reading Kimberley’s tips on financial organization. Id love to have this book for my teaching daughter who works so hard and is trying to raise a family. Great post!! This is a timely book. I agree that we live in uncertain times, and I would like to help out my family financially if I can. Thanks for this post and giveaway! I need all the help I can get. Sounds like a timely book. I’d love to read the book. I won a little prize in the past but never received it. Oh no Doris! Do you remember what it was? This sounds like a good read with useful, practical advice.